First successfully cultivated in Japan in the 1920s by Mikimoto, the Akoya pearl is the perfect gem for earrings. Their size, shape, and luster make them a perfect accessory for every woman’s wardrobe. 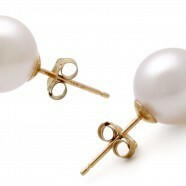 Akoya pearl earrings can be worn with a business suit, formal gown, and even with the most casual of clothes. Before the technology of cultivating pearls was developed, they were found by chance during the harvesting of oysters for food. They soon became prized by royalty and the very rich. The Akoya pearl soon found its way to the jewelry market and became a fast staple to earrings and other pieces. Following nearly 100 years of technology and experience, Akoya cultured pearls are experiencing a resurgence in the world fine jewelry market. The white Akoya is known worldwide as the classic pearl. However, the classic white pearl will have overtones of other subtle colors. All fine pearls posses an inner glow reflecting ambient light that complements the wearer’s radiance. The Akoya pearl is equally beautiful as a stud or dangle earring, and when placed in setting of gold, silver or platinum. Nearly every well-dressed woman in the civilized world owns at least one pair of Akoya pearl earrings. This entry was posted in PearlsOnly and tagged Akoya pearl, Akoya Pearl Earrings by PearlsOnly Team. Bookmark the permalink.